In the June issue, I highlighted how remote monitoring is taking hold in the oil and gas industry, namely shale applications, and just recently oil supermajor, Norway’s Statoil released their 2020 digitalization plan. The supermajor energy company, known for offshore oil drilling, is forecasting $1.2 to 2.35 million of new R&D for digital technologies, as well as the implementation of them. The company mentioned seven areas of interest about the 2020 roadmap and one is the digitalization of work processes and increasing efficiency “by minimizing the need for manual, repetitive tasks.” The push for more condition monitoring in offshore applications is happening as service providers, such as Emerson Automation Solutions provide remote, turnkey solutions. The other areas care advanced data analytics and machine learning that means more sensor for pumps and motors. The third is robotics drilling and remote control operations in the future. According to Statoil, automated drilling has the potential to drill wells up to 15-20% faster by 2020. The interesting backdrop to all of this is Statoil is the only supermajor in the industry that is going full-bore with offshore drilling operations, as the others look to leverage digitalization efficiencies in traditional oil fields, transport, and shale wells. “Digitalisation can help improve the safety and security of our operations, both by means of data that provide us with a better decision-making basis, and through reduced exposure in risky operations,” says Eldar Sætre, Statoil’s chief executive officer. Rapid change in operations is the reality in today’s oil and gas landscape. 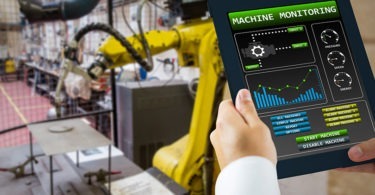 For more IIoT coverage in maintenance and operations, click here!